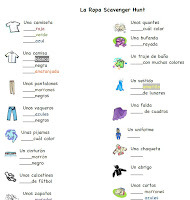 We just finished up our unit on La Ropa (clothes). As I've mentioned in previous posts, we do most of our units on a 2-week schedule, 3 days per week. However, my lesson plans could easily be condensed to a 1-week, 5 day schedule or stretched into a 2-week, 5 day per week schedule. Also, these Spanish unit lessons are not the only Spanish we practice throughout the week. I use these units to focus and build vocabulary and grammar studies, but we also spend a good amount of time reading in Spanish, doing the Spanish version of MEP Math, watching Salsa TV, playing computer/card games in Spanish, and completing the units/activities from Scholastic's Let's Find Out in Spanish. 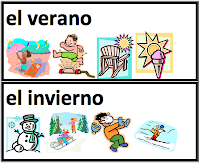 Use the verb "llevar" correctly to tell in which season items of clothing should be worn. I printed two sets of clothing pages from the MES ESL website (page 1, page 2), cut them apart (without the English words), and laminated them. For our 1st day, I started with half the vocab words. I went through our closets collecting the items of clothing we would be learning that day. I began our lesson by showing a picture of each piece of clothing, saying the name, and having the boys repeat it. Next I had the boys take turns finding pieces of clothing in the pile I had gathered. I would say, "Busca _____________." When they found it I helped them say, "Aquí está ______________." We finished our first day's introduction off by reading the book Ropa Sucia by Joanna Emery which we had checked out from the library. We began day 2 by reviewing the vocab I had introduced on day 1. I held up pictures of the vocab words and asked, "Qué es? or Qué son?" The boys took turns telling me what each picture was by saying, "Es _____" or "Son ___________." 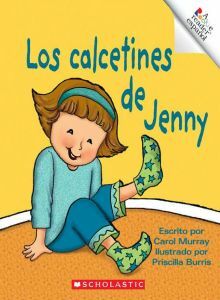 We repeated the same activities from day 1 to introduce the new vocabulary and finished the lesson by reading Los Calcetines de Jenny by Carol Murray, again from the local library. I'm all about combining review activities to cover several topics in one fell swoop. On day 3 we were able to review our clothing vocabulary along with a review of body parts by playing "Dónde Va?" For this game the boys took turns drawing a card with a picture of an article of clothing. They would say the name of the picture, then I would say, "Dónde va(n) ______?" They had to answer "________va(n) en ______." with the part of the body the clothing should be worn on. 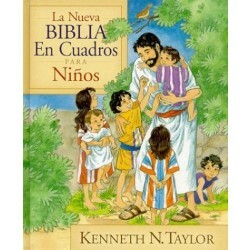 Next we read the bible story "José y la túnica especial" (Joseph's Coat of Many Colors) from La nueva Biblia en cuadros para niños by Kenneth Taylor. I really like this Bible because the stories are nice and short. Since my kids are familiar with most of the stories, they can understand the gist of the story even though they may not understand every word. The book has wonderful illustrations and simple comprehension questions at the end of each story. After reading about José, the boys colored a coat of many colors on a coloring page. On day 4 we began reviewing the vocabulary by playing the boys' new favorite game, Spotlight. For this game, I put the vocab picture cards on shelves, the floor, and in random spots in my closet. I turn out the light and have the kids find the cards with a flashlight. They take turns finding a picture card and saying what it is. "Es un(a) ____." or "Son unos(as) _____. "If they can name it, they get to keep it. Next we played with paper dolls that I printed and laminated from the Making Friends Paper Dolls website. We discussed articles of clothing as we made football players, baseball players, and lots of other fun people. 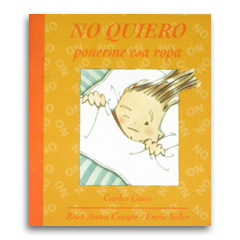 We finished off day 4 by reading No quiero ponerme esa ropa by Carles Cano, also from the local library. Our vocab review for day 5 was BINGO. Easy Spanish BINGO is a link to my article about a super-easy way to make re-usable BINGO. I used the clothing picture cards I already had made. Next we worked on creating clothing catalogs. I had little booklets already printed and ready along with labels of our clothing vocabulary. The only thing the kids had to do was go through catalogs, find each piece of clothing, cut it out, and glue it on the page. We left out the whole price part. We'll save that for another day. For our final day concentrating on clothing, I had a fun little project planned, but first we had to do a little thinking. I already had laminated cards for the 4 seasons up on our school wall. I took them and placed them in the pocket chart along with a label that read, "cualquiera estacion". The boys took turns drawing vocab picture cards and placing them in the season where they would be worn. For each one I would say, "Cuando se lleva ______?". The boys had to respond with, "Se lleva _______en _______." Our last project was a clothing scavenger hunt. I had a list of clothes with specific colors/patterns on a clipboard for each child. We headed off to a nearby thrift shop and set out to find all the items on our list. My five year-old had a lot of fun with it, and the three year-old was bored after checking off 4 items, go figure! Click here for a pdf of this document to print. Thank you for sharing your lessons. It is so difficult to find Spanish materials and ideas. I am the owner/director/teacher of Spanish Splash Preschool, a small, private Spanish-immersion preschool in Greensboro, NC. I teach thematically and this is a new theme for me. You have given me a ton of great ideas and resources to implement in my classroom!